Pleasure rides are long, organised rides covering a mixture of terrain. They’re not as demanding as formal endurance rides, and there are no vet checks involved. They’re run by local endurance groups as social occasions or for training purposes, and also sometimes by hunts and on behalf of charities. They average from 10 – 20 miles, and are great fun. They’re a useful way of socialising young or inexperienced horses, helping to get a horse fit or simply seeing new areas of countryside. Most rides are very well-organised and safe, with strategically-placed stewards at road junctions. Pleasure riding with the Cheshire Endurance GB group in August. How Do I Find a Pleasure Ride? Look in local magazines, on tack shop noticeboards or riding club newsletters. 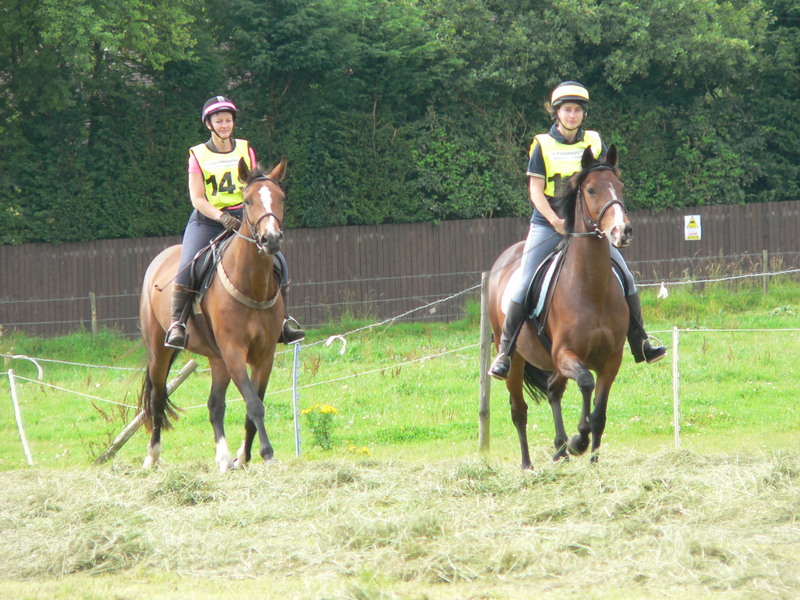 Busy equine professionals such as farriers and vets often hear of local events, or contact your local endurance group. Although pleasure rides are not as demanding as endurance rides, both you and your horse will need to be reasonably fit to enjoy yourselves. Assuming your horse is already hacking fit, start off a month before the ride by increasing your hacking at walk and trot until you’re comfortable riding for a couple of hours. Make sure your horse is well shod before the ride. Gloves. Even if it’s a hot day, your hands may get sore as the day goes on, particularly if you’re using rubber reins. A map case. These are useful so that you don’t have to keep the map in your pocket, but do practice riding with it beforehand as some horses don’t like the flapping noise. fluorescent bands for your horse and a hatband for you if there’s any roadwork involved. Water and bucket for your horse. For your first ride, make sure that you arrive in plenty of time. Collect your map, route instructions and number and ask about any possible route changes. Use the loo if there is one – you may not get another chance! Progamme the emergency contact number into your mobile phone, with the prefix ‘ICE’ (In Case of Emergency). Tack up slowly – don’t rush, and make sure you have everything you want to take. Lock the car, and put a trailer lock on if you have one. Learn your number, and look at the first part of the route. Most horses get a little excited on their first ride, so try to wait for a gap before setting off so that you’re not in a bunch. Give your number to the first steward, who’ll tick you off as having started. If your horse is excited, start off with a brisk trot to settle him. On busy rides, there may be lots of attendees so it’s important not to get in other people’s way. If you need to pass another group, shout first to alert them and ask if it’s OK to pass. It’s normally best to pass at a trot then trot on out of the other people’s sight. Never canter past, and always stop if the other horses are getting upset. Check in with every steward you see, and thank them – remember that all the stewards are volunteers. Once you reach the middle of the ride, give your horse a break – let him walk out on a long rein for a few minutes to stretch. You can also take your feet out of the stirrups if it’s safe to do so. Try to walk the last mile or so of the ride to bring your horse in cool. When you get back to the venue, check in with the steward. Untack as quickly as you can and sponge your horse down if he’s hot. Put on a cooler rug and offer a drink before taking your number back. If your horse is very hot and sweaty, let him cool off before travelling him home. Next time, you could bring some electrolytes to add to his drinking water. Unless they’ve got very excited and galloped all the way round, most horses should have no ill effects the next day. You can go for a short ride to stretch the muscles if you like – but a day off won’t hurt!